Don't worry about your dps in dungeons till you actually get into the end level content. If you are really concerned right now though get rid of your dagger main hand and get two one handed maces/axes/ fist weapons at 2.60 - 2.80 speed for both your main hand and off hand. And yes heirlooms are a big help in a lot of ways. I would recommend not using the dps meter until leveling as it can lower morale especially while leveling when you don't have your artifact or all of your abilities unlocked. 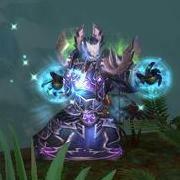 Shaman do a lot more at level because their artifact really boosts it and you get some pretty good end game talents like landslide.